A free meal or two might make your employees more chipper. And happiness translates into increased productivity according to a 2009 study. Healthy food choices matter too. "Many studies show that eating healthier foods leads to more activity, more concentration, more energy and better overall health," says Glassdoor spokesman Scott Dobroski. "Racing to the nearby deli can also eat up time that might otherwise be spent chatting business with colleagues over in-house cuisine." In-house cuisine. All the tech companies are doing it. And there are SO many tech companies in San Francisco these days, with new ones sprouting up weekly, it seems. From well established megasaurs like Twitter and Google who serve from expansive corporate cafeterias, to smaller firms like My Lively, and Crowdtilt, who order in catered meals on a daily basis. There's always excess food. That translates into a Food Runners bonanza. Bonanza! Food Runners volunteer Sam B delivering tech company meal excess. "We had a work event yesterday and I wasn't sure how much to order," says CH, the adorable office manager at a cloud application platform company in SOMA. 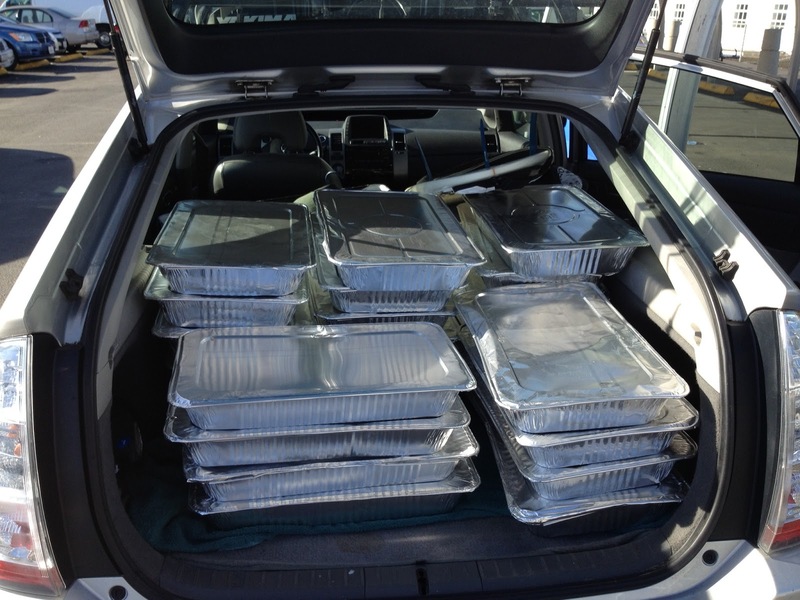 30 trays to Food Runners that day. "We order catered lunch daily," states DG, the CEO of a new start up in the Presidio. "The company we order from requires a minimum of ten meals per order. While I expect us to expand quickly, at the moment, we only have six employees. 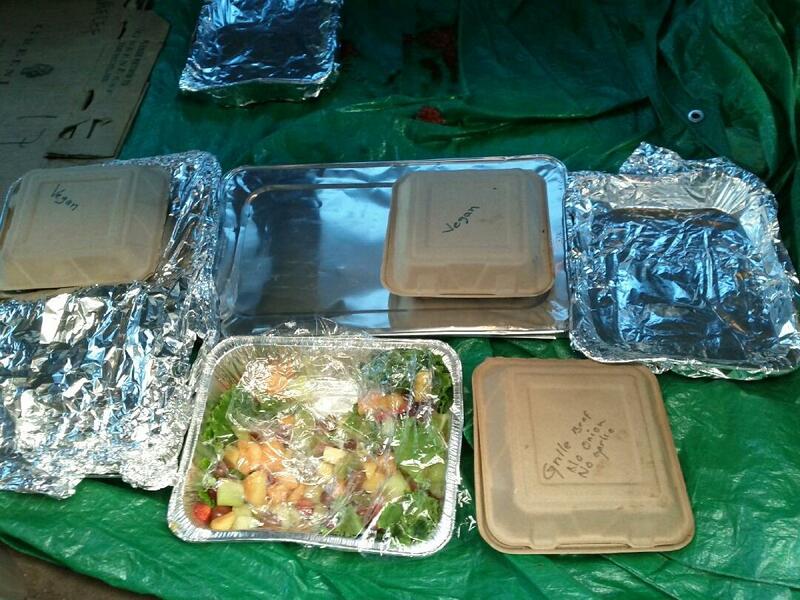 I'm so glad that Food Runners can get our leftovers to where they are needed." 2 boxes of variety including soups, salads, sandwiches and individual entrees to Food Runners every Wednesday and Friday. Typical tech company catered leftovers as seen in the trunk of a FR volunteer's car. "I prepare lunch every day for a number equivalent to 90% of our total workforce," remarks the head chef at a corporate cafeteria of a large, well-known firm. "There is no way of knowing in advance how many employees will eat in-house on a given day and how many will go out. I can't be caught without, so there are always leftovers." Leftovers indeed. An average of 10-20 trays to Food Runners daily. Beginning at 1:30 every weekday afternoon, the calls for pick ups from tech companies flood in. Companies like Tradeshift, Air bnb, Apartment List, Grockit, Heroku, MoPub, Mochi Media, Justin TV, Square, Kiva, Craigslist, BoostCTR, Ampush...phew! The list goes on. And the food is gurrrrrr-REAT!!! These companies really invest their people and they care about their community too. How wonderful is that? And how San Francisco. 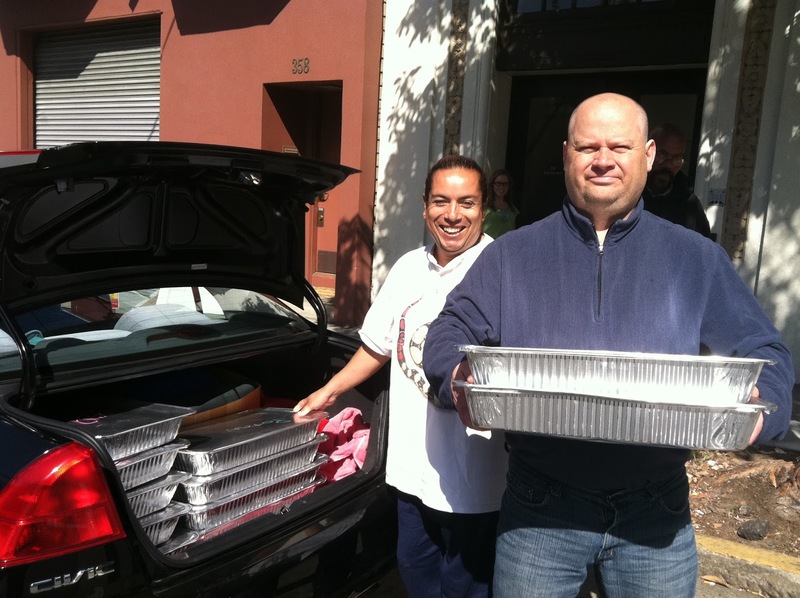 Food Runners recipients like Cameo House, offering supportive, transitional housing to single mothers, love it when a Food Runners volunteer pulls up laden with tech company lunch leftovers. Food Runners and San Francisco's current technocracy: what a perfect match!